Iron chlorosis is the yellowing of the leaf tissue caused by an iron deficiency. In most cases, the veins in the leaf remain green. In more severe cases, the whole leaf will turn yellow. As the summer heats up, the leaves will scorch and turn brown. 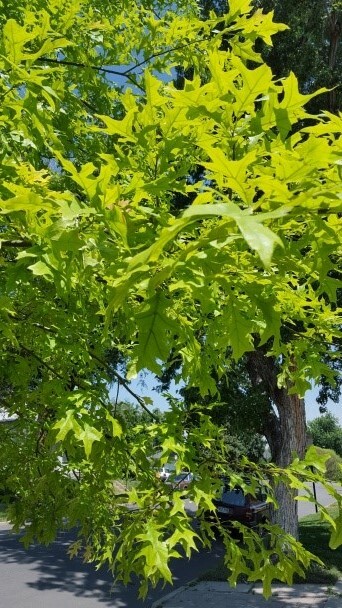 Iron chlorosis is very common in Autumn Blaze Maples and Red Oaks in the Denver area, but there are things you can do to treat it! Many factors contribute to an iron deficiency in trees. Colorado soils have a high PH (Alkaline) and contain free lime. The alkaline soils cause the iron to form an insoluble compound that tree roots cannot absorb. Free lime acts as a PH buffer and makes it very difficult to lower the soil‘s PH. Another factor contributing to iron chlorosis is the presence of a restricted root system, which could be caused by soil compaction, girdling roots or a confined growing space. 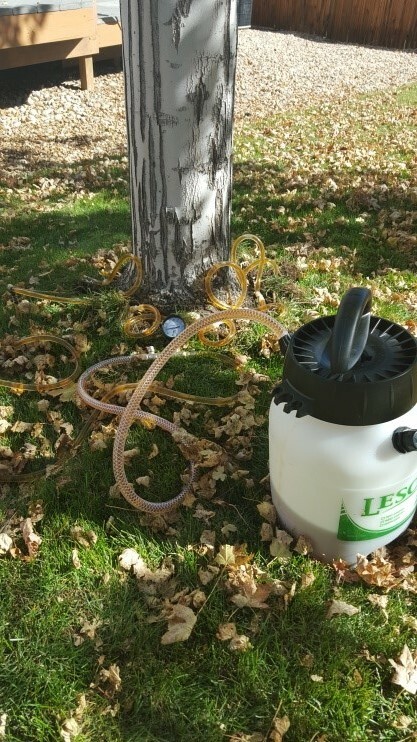 Donovan Arborists applies a macro-injection process to treat iron chlorosis in maple and oak trees. We inject this treatment directly into the xylem tissue where the tree can uptake the material readily. With maple trees, we use a combination of iron and manganese to correct iron chlorosis, while for oaks we use only iron. We also use a product called VerDur®, an excellent choice as one treatment can last up to 3 years, which means less drilling into the tree and, therefore, less money out of your pocket. You can read more about VerDur® to learn its full benefits. Another practice we follow is the application of a low rate of Cambistat®, a growth regulator product that promotes tree root development. This product has shown to be effective on trees that are only mildly affected by an iron deficiency. Using Cambistat® in combination with the macro-injection process, we have seen really good results. Planting a tree species less susceptible to iron chlorosis is the best prevention method. If your tree is on the smaller side, consider removing and replacing it with a species less prone to iron deficiency. Doing so will save you money in the long run. There are a lot of quality tree species requiring far less maintenance. Adding small amounts of organic matter to your tree’s root zone can help improve the stability of its soil. Organic matter improves water permeability, feeds micro-organisms and helps correct soil compaction. It takes many years to see even a slight improvement but the benefits are worth the effort. We recommend adding about ¼ inch of Peat Moss over the root zone of the tree in the spring and fall. Over time, this will greatly improve the soil for your trees. If you are struggling with iron chlorosis in your trees, we would love to talk with you and find a solution. We are locally-owned and operated in Denver, CO and service the greater metro area and surrounding cities. Dedicated to protecting your investments and helping your trees thrive in the most environmentally-friendly way possible, we are ISA-Certified with 21 years of experience in the Front Range. Call us today at 303-623-8733 for a free estimate, or send an email to paul@denvertees.com.